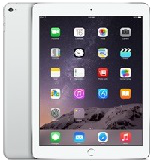 The Apple iPad Air 2 is considered as the sixth generation iPad device. Despite its size, however, the iPad Air 2 has a weight of just 15.41 oz. and a thickness of only 0.24 inches. True to its name, the iPad Air 2 feels light on the hands. Compared to its predecessor, the iPad Air, the iPad Air 2 is slightly thinner. The tablet has a display screen of 9.7 inches complete with Retina Display and oleophobic coating. Its resolution is at an astounding rate of 1536 x 2048 pixels, making it deliver quality graphics. Running on A8X chip, the iPad Air 2 is a lot powerful and is the fastest it has ever been. Equipped with an 8MP iSight camera on its rear, the iPad Air 2 is able to capture detailed photographs and even record 1080p Full HD videos. It sports a secondary front-facing 1.2MP camera that enables video chats on FaceTime HD and even takes self-portraits. 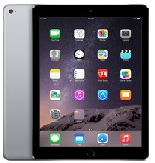 The iPad Air 2 is available in either Wi-Fi only or Wi-Fi + Cellular models, which help determine how users are able to connect to the internet. 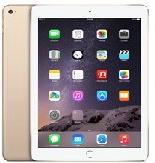 Available in three finish options: Space Gray, Gold and Silver, the iPad Air 2 is able to capture a distinct market of its own. The iPad Air 2 also comes in three storage capacity sizes—16GB, 64GB, and 128GB; proving that there’s always an iPad Air device suitable for anybody! Apple’s iPad Air 2 review is here! Does the iPad Air 2 deserve the ‘Best iPad Ever’ title? Find out in our full review above!